Billy Preston's career has spanned five decades, starting as a child prodigy playing the movie role of young W.C. Handy and then playing organ for the likes of Ray Charles and Little Richard. His accomplishments are highlighted by a string of hits, including collaborating with some of the most celebrated names in the music industry, The Rolling Stones, Aretha Franklin, Bob Dylan, The Jackson Five, Sly and the Family Stone, Barbara Streisand, Sammy Davis Jr., Quincy Jones and perhaps the most famous of all, The Beatles. Billy's relationship with The Beatles led to his signing with Apple Records in the 60's. Billy is widely acknowledged as the "Fifth Beatle" having been the only party to ever hand his name included in the label credits of the "Let It Be" and the "Abbey Road" albums as well as the landmark "White Album". Billy also appeared with them in the films "The Complete Beatles" and "Let It Be" as well as performing as part of them during their historic rooftop final concert. In the late '60s Billy worked with John Lennon and Yoko Ono on their solo "Plastic Ono Band" album as well as Ringo Starr's solo single "Oh My My" and he participated in George Harrison's American Tour. In addition Billy Preston was a leading character in the movie "Sgt. Pepper's Lonely Hearts Club Band" also featuring Peter Frampton and the Bee Gees, performing a stunning version of "Get Back". Preston's name and fame were solidified as a solo artist when he scored a string of Number 1 hit singles including the Grammy winning "Outta Space", "Will It Go Round In Circles", "Nothing From Nothing" and "Space Race". 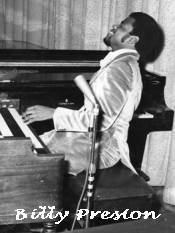 A prolific writer, Billy Preston penned the multi-platinum standard "You Are So Beautiful" which was performed by his friend Joe Cocker. He also wrote the title songs for a series of box office champions including "Never Gonna Say Goodbye" "Fast Break" and "O'Hara's Wide". The title song from "Fast Break" became a Preston classic hit when performed as a duet with the late Syreeta Wright. Billy also co-wrote the score for the Sidney Poitier movie "They Call Me Mr. Tibbs" with Quincy Jones. In recent years Billy Preston was the first black musical director of a late night television show "Nightlife" starring David Brenner, was a regular on the UPN series "Good News" and he made a cameo appearance in "Blues Brothers 2000" as part of the super group that included Eric Clapton and Stevie Winwood and B.B. King among others. Billy's participation in the tribute concert "Concert for George Harrison" at Royal Albert Hall and his performance of "My Sweet Lord" has received critical acclaim. Billy recorded on the last album his mentor Ray Charles was to record, toured with The Funk Brothers and Stevie Winwood in Europe in early 2004 and then hit the road, touring extensively and garnering rave reviews for his performances with his dear friend Eric Clapton through Europe and North America. Billy's keyboard dominance was highlighted with the release of the "Let It Be--Naked" album issue. With his extensive touring and studio involvement Billy Preston has found the time to create special project tribute to his dear friends The Beatles. He's even penned two new songs, one in tribute to George Harrison and another to all four of the fab fellows, "John, Paul, George and Ringo". This project along with a historic DVD companion is due for a fall 2004 release with special appearances and bonuses for Beatles fans.